In a Kitchen Counter Bouquet! I often take parsley for granted, but if there isn't any growing in the garden I really miss it. It's just so versatile—and tasty. I love it in this Confetti Egg Salad Recipe I recently wrote about on Farmgirl Fare. This curly parsley is from a plant that overwintered in the greenhouse. I usually grow Italian flat leaf parsley from seed (my favorite variety is Prezzemolo Gigante D'Italia, which I order from Pinetree Garden Seeds; 600 seeds for $1.15), but a friend who was experiencing a parsley explosion in his garden last spring offered me a couple of curled parsley plants, and I never say no to free herbs. Once the temperatures started warming up, my scraggly little greenhouse parsley plant took off, but then it began to bolt. I snipped off the main center stem, plunked it into a 'vase' of water, and set it on the kitchen counter. Three weeks later it looked almost as good as the day I picked it. I changed the water once. Last year I wrote about the best ways to store fresh basil (this post also talks about my new found love for purple basil), and I mentioned that one of our lamb customers keeps a big bunch of basil in a pitcher of water on her kitchen counter during the summer. I said I needed to try this, and several of you let me know that you store your basil this way, too. I made some basil 'bouquets,' last summer and it worked great, so I figured I'd try it this year with parsley, too. 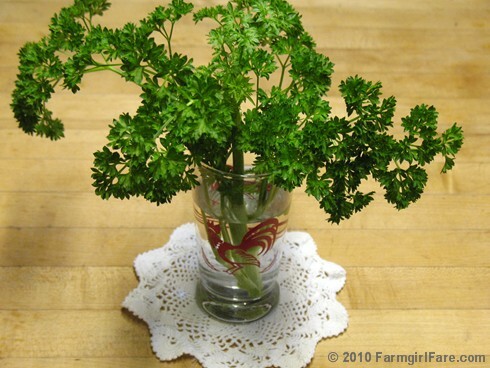 I usually store parsley in the refrigerator (often for several weeks), washed and wrapped in a plastic bag with a paper towel, but having it out on the counter is so much more fun—and visible. I'm one of those 'out of sight, out of mind' people, so a big green reminder in the middle of the kitchen is exactly what I need. A lot of sources advise you to store your fresh herbs in a glass of water in the refrigerator, but I don't find it necessary. Herbs thrive outside in the sun and heat, and if the water is keeping them from wilting, there's really no reason to chill them. Besides, I know I'd probably reach into the fridge and knock the glass over an hour after putting it in there. 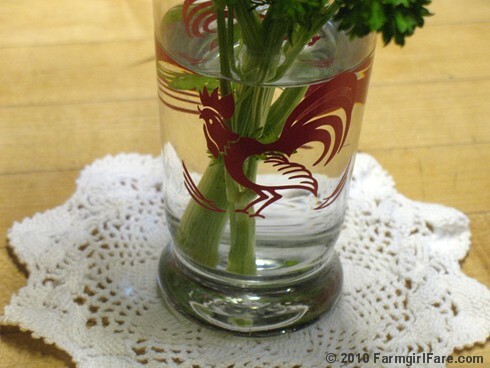 As for this cute rooster glass, I spied it during a recent trip to World Market (I love that store) and couldn't resist bringing home a couple of them. At the rate we tend to break glasses around here, though (I'm down to my last little World Market sheep glass), I'm thinking I probably should have bought four. Do you grow parsley? Store vases of fresh herbs on the counter? Have a thing for animal glassware? Do tell! © Copyright 2010 FarmgirlFare.com, the curled up foodie farm blog where I love that part in The Fabulous Baker Boys where Michelle Pfeiffer compares the song 'Feelings' to parsley, even though it wasn't really very fair to parsley. Parsley grows itself in my wet, west coast of Canada garden!! It is a menace, but I can't resist letting it live almost anywhere it likes... although I have learnt to pull out the oregano which also takes over everywhere. Luckily I eat both of them, a lot! I can pick it fresh year round pretty much, just outside my back door. My parsley just comes up now all by itself in my first raised bed. I have to weed it out when it is taking a space I need for another plant. But, I love it. When it is between the going to seed stage and the little ones are too small to use, I really miss it. Mine is the curly leaf, very hardy and bright green. I have to start the Italian type or buy a plant and it never comes back. Wonder why? I'm growing a lot of basil this year so I can make one of my favorite soups (tomato basil). Who'd have thunk about keeping it fresh in a bouquet!?! So cool! No to all of the above. And I might be the only person in the world who doesn't like parsley. We grow it anyway, though, because the MiL loves it. And I break a LOT of glasses in our nice hard porcelain sink. Or on our inconveniently low faucets in the sink while I'm washing dishes. We have some pretty thick, almost indestructible glasses made in France that can withstand our sink, but wine glasses, beer glasses, and anything else made of thin glass? Forget it. I live in fear of breaking some of Aunt Elizabeth's crystal glassware (who was actually like a great-great aunt, so we're talking OLD, irreplaceable stuff). I store any cut herbs in an old label-free jar on the kitchen counter and replace the water whenever I remember or they start to look icky at the bottoms. I got one of those in-fridge herb keeper things, but I always forget it's in there and then I find gooey herbs a year later. GROSS. After having to dig and amend and test soil around my last parsley plant, I've taken to planting all my biennial and perennial herbs in the landscaping where they can live out their lives undisturbed by my trowel or invading tomatoes. And ever since growing parsley in the garden, I can't NOT have it. It goes in everything. Also perennial herb musts: thyme (lemon and regular), oregano, rosemary, lemongrass and lavender. I love your blog. I just stopped to get a link to your great chard post from 2007 to put it as a link on my next post (on, you guessed it, chard). I had to check out what you've been up to lately, and chuckled when I saw your current post's topic. I have a cilantro bouquet right now! I allotted one bed to my parsley because they are like weeds when they burst out. i love parsley too ! i do all the usual things with it but i also freeze a lot to make parsley tea with. one bunch of parsley and two qts of water.....bring to a boil and let steep. 2 oz in the morning and 2 oz at dinner. I love your blog! And thanks for visiting mine! I know I'll be visiting often. I've always grown herbs and tomatoes and such in containers but this year (after removing a ton of trees in the yard) I have space and sun for a true veggie garden. So excited for lots of fresh veggies this summer! Although I store basil in a vase (in the fall), I never thought to do that with parsley. This year I bought nursery started parsley. I know I know. It was painful! Why buy an herb you can start from seed? I just found that their nursery starts are so early that it comes in just in time to line up with my other cooking. I don't use parsley much in the height of the summer. I didn't know it was a bienniel..I'll have to try that out. I freeze parsley that I can't use. It's nice to have during the winter for soups and sauces. Nope, no TV series for me - you're probably thinking of The Pioneer Woman.